We’re back again for Week 14 of the NFL season to identify some sleeper candidates who could find themselves more valuable in fantasy football sooner or later. Week 14 marks the beginning of the playoffs in many fantasy formats. That may not make it the best time to hunt for sleepers in traditional formats, but it’s ideal for the teams that missed out in dynasty and keeper leagues. My rushing and receiving Yards Added metrics compare a skill player’s yardage totals on their plays relative to expected totals based on factors like the down and distance, distance from the end zone, quality of run-blocking, and quality of coverage. As such, they are perfect tools to identify players who could see a bump in future workload because of their efficiency. A few such players stand out as sleepers for Week 14 and beyond, and a few even have a chance to make an impact in your fantasy playoffs. The timing of the Kareem Hunt news prevented me from listing Spencer Ware in this article last week, but I’m not sure he really qualified as a sleeper in any case. Ware finished as an RB2 as the featured Chiefs back in 2016 before he injured his knee the following preseason and subsequently lost his job to the rookie Hunt. Fantasy owners rightly viewed Ware as one of the game’s premiere handcuffs. “Premiere handcuff” is a compliment, but I think its implication still undersells Ware’s abilities. He hasn’t performed as well as Hunt, but Ware has added 68 yards as a rusher and 51 as a receiver in his time with the team, which are some of the best totals at the position in all of football despite a lack of playing time. I wouldn’t want to let Ware get away from me if I had him at this point, but he was just one of the many unheralded backs the Chiefs have turned into effective three-down backs and fantasy standouts in recent seasons. And with Hunt released from the team, I think rookie Williams becomes a real sleeper to be next in that line. Williams played behind Leonard Fournette and Derrius Guice for his full career at LSU and didn’t have a ton of opportunities to prove himself. That plus a poor 4.70-second 40 time left him undrafted. However, my research suggests that the bench press and short shuttle are better predictors of running back success than their 40 times, and he excelled in those with 22 bench reps and a 4.21-second shuttle time. He also led all backs in the 2018 rookie class with 12.2 yards per reception in college and caught a pass on more than a tenth of his college touches. I think he has three-down potential. Williams took just three backfield snaps in Week 13. He would likely need a Ware injury to tap into that potential over the final month of this season, and even that may not be enough in light of the team re-signing Charcandrick West. That makes Williams more of a dynasty stash than must-have handcuff in 2018. But he’s likely freely available in the former, and he shouldn’t be. Sticking with the Chiefs theme, Sammy Watkins’ foot injury has now cost him in essence three weeks since he’s missed games on both sides of the Chiefs’ Week 12 bye. I probably don’t need to remind his fantasy owners that he hasn’t played a full season since his rookie year in 2014. Conley saw 6 or more targets in just two of his last 30 games before the Watkins injury, but he has been efficient in those limited opportunities. He has 12 Yards Added on his 92 catchable targets in that time. That 0.13 Yards Added per catchable target pace is a bit ahead of notable star receivers like Brandin Cooks (0.12), Jarvis Landry (0.09), Odell Beckham Jr. (0.06), and Julio Jones (0.06). And now with Watkins out, Conley has seen 8 and 7 targets his last two games. Conley is as usable a handcuff for Watkins as Ware is for Hunt, but Conley is available in 84% of leagues, not 12%. Burkhead was the last of the Patriots backs to make a healthy return to the team this season, and you might assume he is too late to return to fantasy relevance given the success James White and Sony Michel have had. I’m more optimistic. Despite their fantasy production, White and Michel have combined to cost the Patriots 57 yards on their rushing attempts. Burkhead drew 7 carries in his first game back, and I wouldn’t be surprised to see that number jump a bit more in the team’s upcoming games. The bigger reason for optimism is that Burkhead’s greatest strengths are on the plays that earn the most fantasy points. He has 9 RecYards Added on 40 catchable targets with the Patriots, which is a 0.24 pace that is better than even White’s (0.11). Meanwhile, Burkhead has scored on 4 of his 7 attempts within five yards of the end zone with the Patriots the last two seasons. That’s a much better rate than either Michel (3 of 11) or White (2 of 8). If he can recapture that work from fullback vulture James Develin, Burkhead could become a flex option even with just 10-12 touches per game. Matt Breida has been one of the better all-around backs in football this year with 24 RuYards Added and 14 RecYards Added. His success will likely cause many fantasy owners to dismiss Wilson’s 15-carry, 8-reception outburst in Seattle on Sunday, especially since Breida left that game early in the third quarter with an ankle injury. I think that’s a mistake. Wilson was a major part of the 49ers’ running attack even before Breida’s injury. He out-carried Breida 7-5 and out-targeted him 3-2 in the first half. There’s no doubt that the blowout led to a lot of Wilson’s opportunities in the passing game, but he was still efficient on those opportunities with 0.3 Catches and 5 RecYards Added. The team’s presumptive top-two receivers Marquise Goodwin and Pierre Garcon have missed a lot of time this year and performed poorly with -12 and -26 Yards Added when they have played. I expect the 49ers to continue to rely heavily on tight end George Kittle and its running backs. That could make Wilson usable in PPR formats even with Breida sharing the load. The tragic fall of Fitzmagic has left a void of relevant Harvard football grads in the NFL, and I’m starting to think that Titans tight end Firkser might fill it. Firkser chose Harvard over some other schools that offered him scholarships because they allowed him to play football and basketball. But at just 6-2 and 246 pounds, he’s too short to get the “basketball-turned-football-player” bump that project tight ends like Rico Gathers often get. Firkser isn’t fast, either. He ran a 4.79-second 40-yard dash at the combine. But Firsker does have the ability to quickly get open that has become such a crucial trait in the modern game. That is probably best illustrated by his 6.88-second time in the three-cone drill. Only three of the 67 tight ends for whom I have times since 2013 have beaten him, and Mike Gesicki (6.76), O.J. Howard (6.85), and Blake Bell (6.85) were all drafted in the first four rounds. Really, the best case to stash Firkser in dynasty and deeper formats is his demonstrated efficiency. He’s caught all 13 of his targets this season and now leads the team with 0.9 Catches Added. He’s also added more than a yard per catchable target, which is nearly double the efficiency of his TE teammate Jonnu Smith. That productivity seems to be earning the trust of the Titans coaches. He set a season-high with 18 offensive snaps in Week 13, and he also shed his special teams responsibilities for the first time. 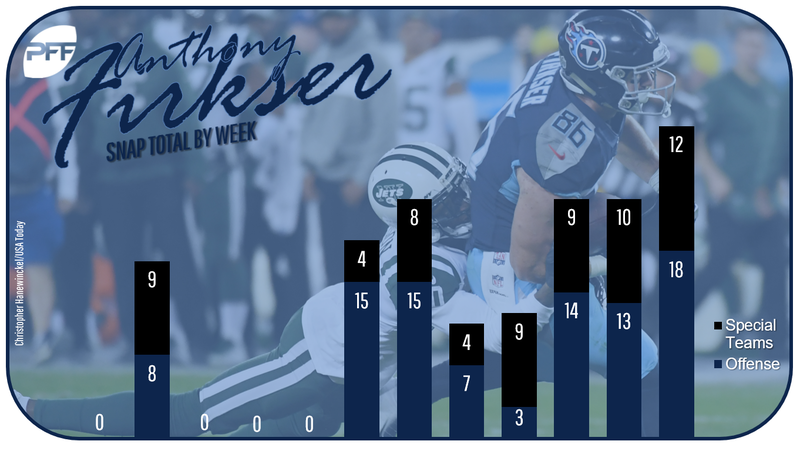 The 3-4 targets per game Firsker has seen over the last three games isn’t enough to make him fantasy-relevant just yet, but he is trending in the right direction.